Previous Versions takes a snapshot of Shares and your My Documents folder at 7am and 12 noon each day. You can restore files and folders from this function yourself. It is useful if you have accidently deleted a file, or overwritten/changed the wrong file. The amount of time you can go back varies depending on available storage space, but it is common to be able to go back a month in time. Locate the folder that holds the document you would like to recover. In the "File versions" list, select a version you would like to restore. Click the "Open" button to check out the contents. 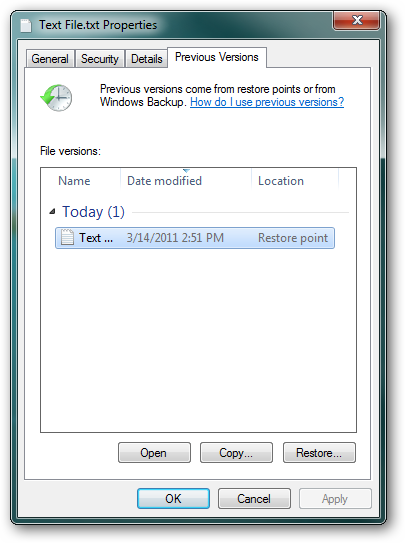 To quickly restore the previous version, click on the Restore button. You will be prompted to overwrite the existing file version if it exists in the same location.